Earlier this month, nearly 100 people gathered in Texas’ state capital to demand that a billionaire oil pipeline operator resign from his post on the Texas Parks & Wildlife Commission. Kelcy Warren is the chairman and CEO of Energy Transfer Partners, the company behind the controversial Dakota Access Pipeline as well as other major oil and gas pipeline projects. Governor Greg Abbott appointed Warren to the parks and wildlife commission last year, leading some to argue that he presented a major conflict of interest. At the wildlife board’s November 3 meeting, for instance, the commission was scheduled to vote on—what else?—an easement for a pipeline in a state park. “I do not believe you can honestly make objective decisions on behalf of the parks you’re appointed to protect,” one protester reportedly told Warren at the meeting. Warren later recused himself from the vote and the issue was tabled. But his influence and the influence of his Energy Transfer Partners can be plainly seen across Texas. Much like the state government, the state’s public university system has formed a predictably close relationship with oil and gas interests. A program called University Lands manages the surface and mineral rights of over 2.1 million acres of land in Texas and then sends the money from oil and gas leases back into the University of Texas campuses. In 1996, the university formed a unique partnership with what it describes as "the first investment corporation formed by a public university system.” The arrangement “is the largest public one of its kind in the nation,” holding over $20 billion in assets, according to NASDAQ’s 2014 report. Called the University of Texas Investment Management Company, or UTIMCO, the university’s investment arm has purchased shares in numerous Texas-born corporations like Texas Instruments and Whole Foods, as well as the fossil fuel industry, according to SEC records. Listed in UTIMCO’s 2014 filings are 180,099 shares in Energy Transfer Partners. The same form also shows that UTIMCO purchased shares in several of Energy Transfer Partners' subsidiary companies: there are 147,928 shares in Sunoco Logistics and 257,643 shares in Regency Energy Partners, both companies owned by Energy Transfer Partners. “Unfortunately we have no information to provide as UTIMCO does not comment on the underlying holdings of our investment partners,” University of Texas spokesman Melanie Thompson tells ConsumerAffairs. CEO Warren’s net worth is estimated at $3.8 billion, and public institutions enjoy the fruits of his philanthropy. Warren’s donations include an endowment at his alma matter, the University of Texas campus in Arlington. He also sunk a reported $10 million into a new, popular urban park in Dallas that is built on top of a freeway, part of a private-public partnership with the city. A self-described folk music fan, Warren is the founder of the Cherokee Crossroads music festival, which raises money for children’s charities. For his donations, the Horatio Algier Association presented him a philanthropy award late last year. Not mentioned in the accompanying press release for his award: Warren has also donated $700,000 to the campaign of Texas Governor Abbott, who then appointed Warren to the Texas Parks and Wildlife Commission after his election. Warren’s philanthropic image is at odds with reports currently coming from North Dakota. The Dakota Access Pipeline, slated to carry crude oil from the Dakotas to Illinois, has mostly enjoyed federal support but has been meet with intense resistance from locals along the route. Since then, the Standing Rock Sioux and others protesting at the site have been arrested, and according to some accounts, abused and attacked by the local police department while peacefully protesting. One widely-shared video shows a journalist being shot in the back by a rubber bullet, though the police department denied that the encounter took place. Early reports from the scene claimed that the company’s own private security workers even let violent dogs loose on the protesters. "We reiterate our commitment to protect cultural resources, the environment and public safety," Energy Transfer Partners' spokeswoman told reporters last month. In the longer-term, of particular concern to the Standing Rock Sioux is that the pipeline is being bored underneath Lake Oahe, a source of drinking water. According to a recent report in Reuters, Energy Transfer Partners’ subsidiary Sunoco Logistics has experienced over 200 oil leaks in its pipelines over the last six years, giving the company a worse record of transferring crude than any of its competitors. 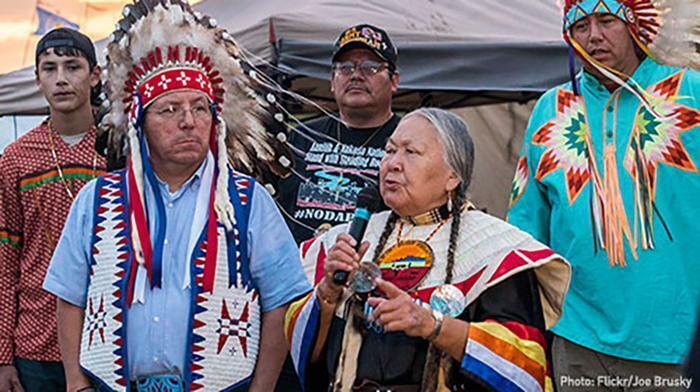 On Monday, the tribe won a minor victory, when the Army Corps of Engineers agreed to seek further public input before letting Energy Transfer Partners continue installing the pipeline. Warren told the Wall Street Journal that he is confident that any delays will go away once President-elect Donald Trump takes office. Trump has reportedly invested at least $500,000 in Energy Transfer Partners.